Frankfurt, Monday, 7 August 2017 – The honorary prize for Architects’ Client of the Year, with which the jury pays tribute to the promotion of a holistic understanding of architecture by a commissioning entity, went to the City of Hamburg. 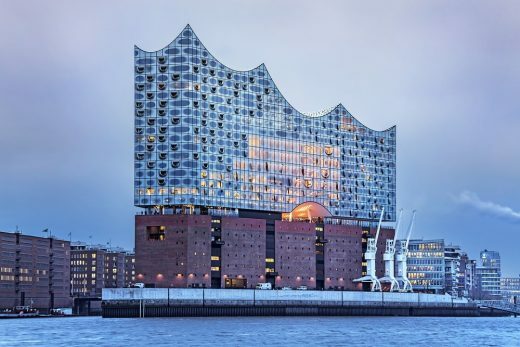 The Elbphilharmonie, which opened in 2017, is not merely another concert hall, but a world-class architectural icon of inestimable cultural value. 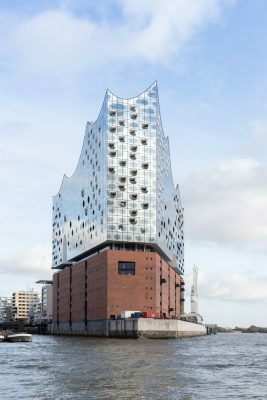 Hamburg, 12.01.2017 – Last night, a ceremony and the inaugural concert marked the official opening of the Elbphilharmonie Hamburg. 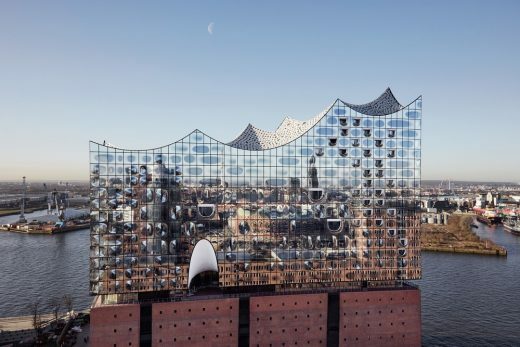 The concert hall is the new musical heart of the northern German metropolis. The spectacular venue uses its architecture and its programme to combine artistic excellence with the utmost in openness and accessibility. 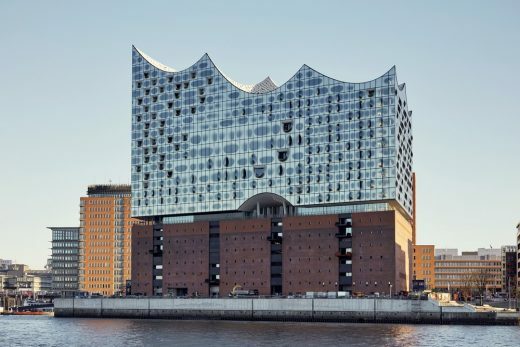 Designed by architects Herzog & de Meuron and located between the city and the harbour, the Elbphilharmonie unites the former Kaispeicher warehouse with a new glass structure featuring wave-like peaks and valleys on top. 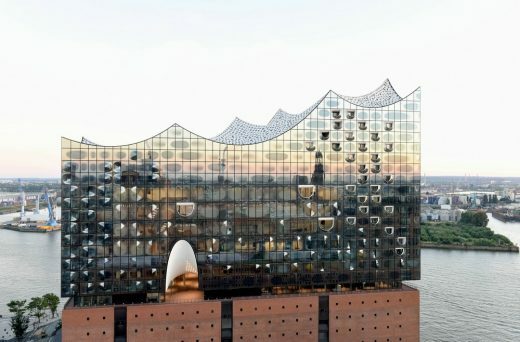 In addition to three concert halls, among other features, the building is home to a hotel and a viewing platform which is open to the public and which underscores the new landmark’s character as a »house for all«. A ceremony in the Grand Hall marked the beginning of the opening festivities. Guests included German Federal Chancellor Angela Merkel and numerous other high-ranking representatives from the worlds of politics and culture. 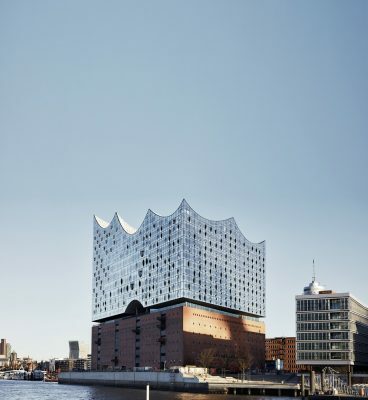 For the occasion, addresses were given by German Federal President Joachim Gauck, Mayor of Hamburg Olaf Scholz, Christoph Lieben-Seutter, General and Artistic Director of the Elbphilharmonie, and Jacques Herzog from Herzog & de Meuron. 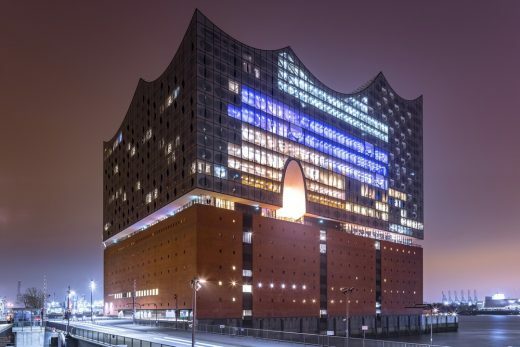 In the Grand Hall, the NDR Elbphilharmonie Orchestra under the direction of its Chief Conductor Thomas Hengelbrock performed with the choir of the Bayerischer Rundfunk, and soloists Philippe Jaroussky (countertenor), Camilla Tilling (soprano), Wiebke Lehmkuhl (mezzo-soprano), Pavol Breslik (tenor) and Bryn Terfel (bass-baritone). One of the highlights was the first performance of a work commissioned specially for the occasion by the German contemporary composer Wolfgang Rihm entitled »Reminiszenz Triptychon und Spruch in memoriam Hans Henny Jahnn« for Tenor and Orchestra. The programme also included Beethoven’s Symphony No 9 in D minor, giving perfect expression to the festive atmosphere of the new concert hall and giving a glimpse of the outstanding work undertaken by acoustician Yasuhisa Toyota. 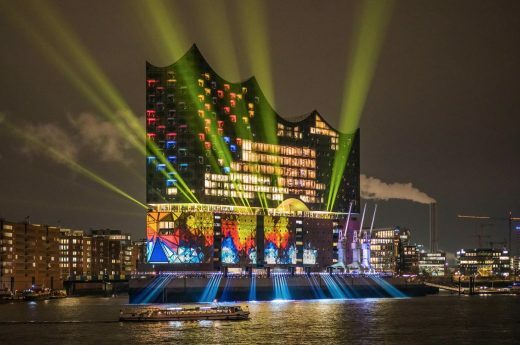 During the concert, the façade of the Elbphilharmonie was transformed into a canvas for a spectacular light display, interpreting the music played inside the Grand Hall in light and colour in real time projections on to the building’s façade. Located in the modern HafenCity area of Hamburg, on the banks of the River Elbe, the spectacular building, designed by Swiss architects, Herzog & de Meuron, houses three concert halls, a large music education area, the Plaza – a 360° public viewing platform with views over the whole city from a height of 37 metres above ground level – and a hotel. 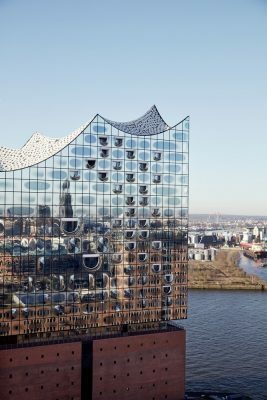 As the orchestra in residence, the NDR Elbphilharmonie Orchestra will open the concert hall on 11 and 12 January 2017 in two special concerts conducted by its chief conductor Thomas Hengelbrock. 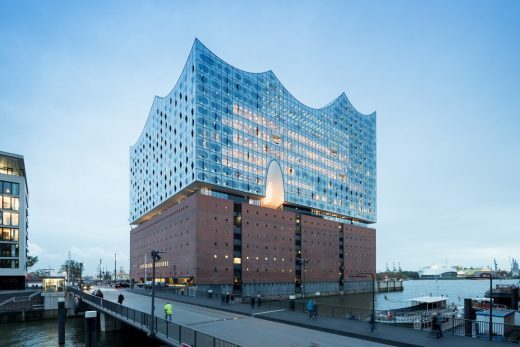 The centrepiece of the Elbphilharmonie is the 2,100 seat Grand Hall, with an acoustic environment designed by internationally acclaimed acoustician, Yasuhisa Toyota. The Grand Hall is housed in a dazzling new glass structure that rises up to a height of 110 metres on top of the former Kaispeicher A, a historic warehouse that was previously used for storing tea, tobacco and cocoa. 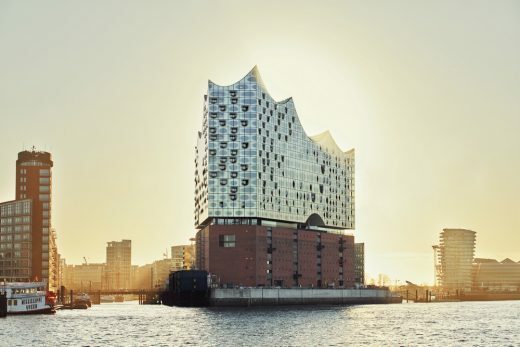 With its spectacular architecture, the Elbphilharmonie reflects the uniqe maritime character of Hamburg – a city that is built on tradition and modernity, a city of ruggedness and beauty, contrasts that are so characteristic of Hamburg’s appeal as major world city. 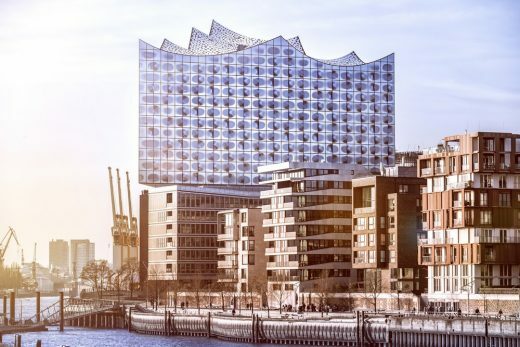 The programme at the Elbphilharmonie Hamburg will range widely to reach the largest possible audience and includes classical music, world music, pop and jazz: the new concert hall aims to offer music for everyone. The opening concerts on 11 and 12 January 2017 will be followed by a three-week festival featuring ensembles including the Chicago Symphony Orchestra, the Vienna Philharmonic Orchestra and the Berlin-based band Einstürzende Neubauten. The programme for the first half of 2017 features more than 300 events, offering musical experiences for everyone. 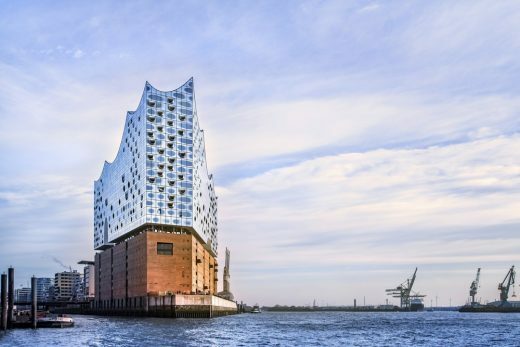 The new Elbphilharmonie website gives visitors a virtual taste of the concert hall before it opens in January 2017 on www.countdown.elbphilharmonie.de/en. 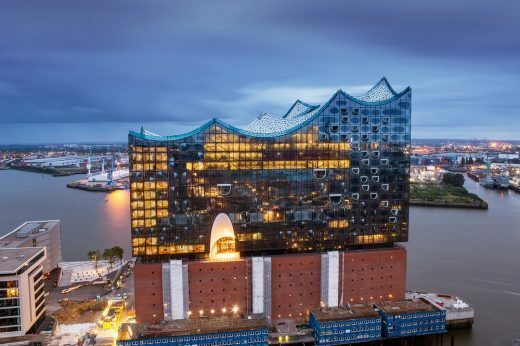 Among its unique features is a fast-paced drone race starring the architecture of the Elbphilharmonie, giving visitors a chance to fly round and over the concert hall, and enjoy previously unseen perspectives of the city at breakneck speed. 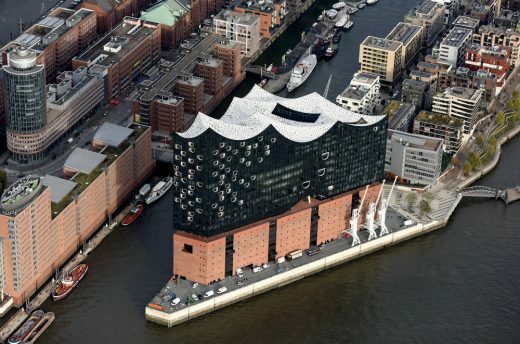 With 1.8 million inhabitants, Hamburg is Germany’s second biggest city after Berlin. 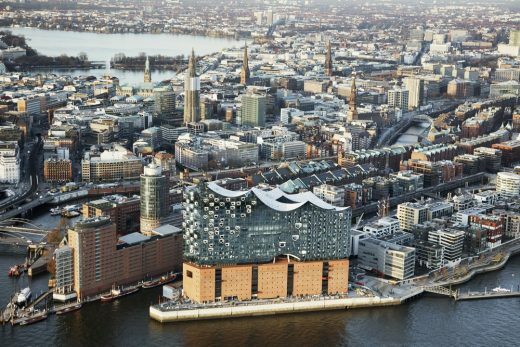 The Hamburg Metropolitan Region with its 5 million residents is one of the most productive and prosperous regions in Europe. 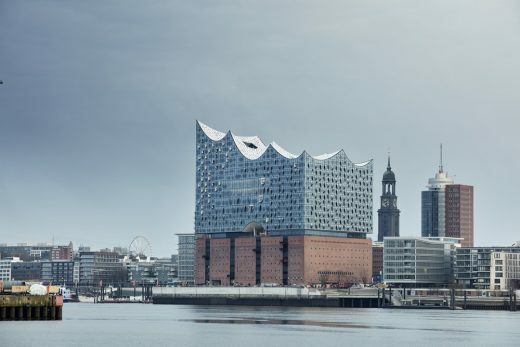 As a centuries-old port and trading city, Hamburg maintains relations throughout the world and is Northern and Eastern Europe’s hub for importing and exporting. 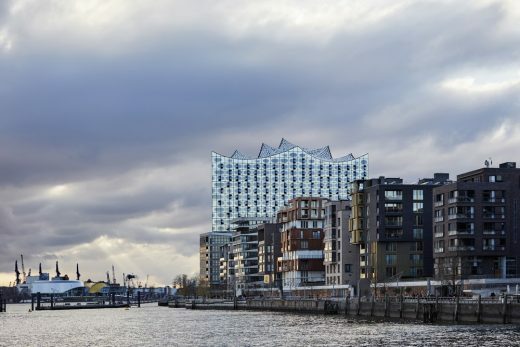 As well as boasting flourishing trade and a booming logistics industry, Hamburg is also Germany’s media capital. The city is considered to be the greenest metropolitan region in Europe: one-fifth of the city’s area is covered by water. 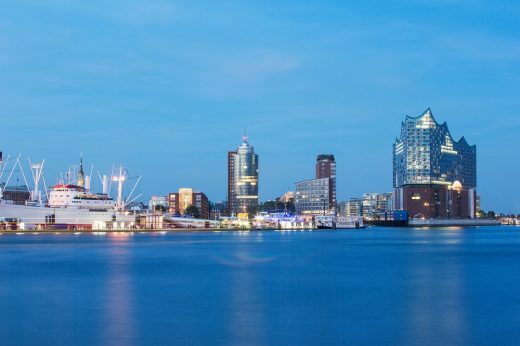 Furthermore, Hamburg is shaped by two rivers: the Elbe and the smaller Alster with its dammed-up lake in the city centre. Surrounded by these two rivers, a maritime city unfolds, that includes anything from the elegant district of Blankenese to vibrant off-scene quarters. 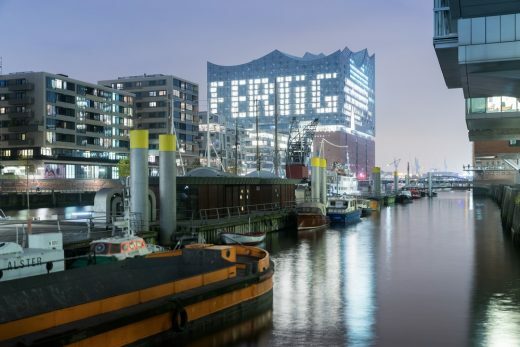 In recent years, ambitious urban development projects such as the HafenCity Hamburg, a rich cultural life and the city’s premium location on the water have attracted an ever-increasing number of tourists to Northern Germany. 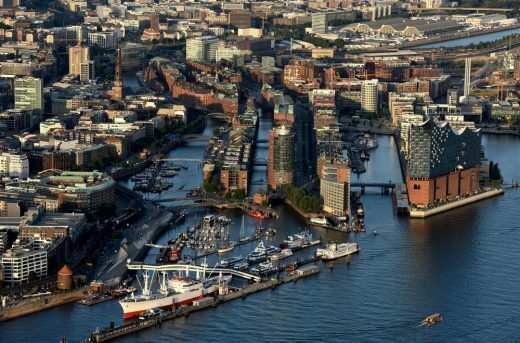 Hamburg has since risen to be ranked in the top ten destinations of European cities.